In March, two members of the Foundation 1 concrete team attended national certification training in St. Louis for the EliteCrete System of decorative concrete and performance flooring. This is a premiere decorative concrete finishes company who has installed systems for such companies as Apple, Hilton, FedEx, H&M, Levis, Ferrari, and FedEx. Foundation 1 is proud to bring this high end line to residences and businesses in the Kansas City metro. EliteCrete features a full line of epoxy and concrete refinishing coatings. You can see a number of photos at their website at www.elitecrete.com. In addition to a number of finish coatings (from very basic to extremely complex! ), the system also incorporates a refinishing system which allows us to patch damaged concrete prior to adding a decorative finish. Previously, we only had the option to lift and patch damaged concrete or tear out and replace. Now we have the option to treat and finish – often for significantly less than other (less appealing) options! Applications are extremely diverse including residential applications such as garages, driveways, basements, patios, sidewalks, porches, and pool surfaces. Really anywhere there is a concrete slab! Commercial applications include retail, hospitality, office, municipality, schools, warehousing, and outdoor. Applications are really only as limited as your creativity! There are a number of color options, flake options, finishes, and patterns, including wood floor and stone. There are nearly a limitless number of options with stains, epoxies, and resins. 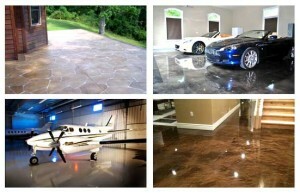 Many of these finishes are self leveling. Foundation 1 offers a number of services including foundation repair, waterproofing, mudjacking, and concrete. Our decorative concrete services offering matches any in the metro and is greatly expanded through our collaboration with EliteCrete Systems. Based out of Raytown, Foundation 1 works with residential and commercial customers in both Kansas and Missouri in the KC metro. The company has serviced thousands of customers since its inception in 2001.